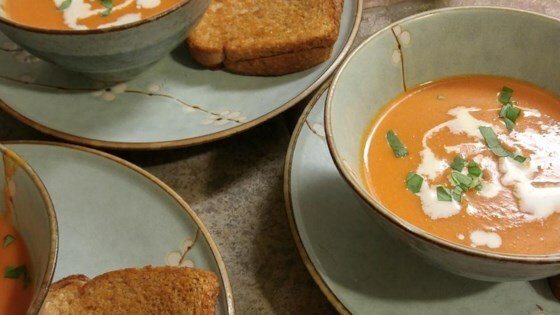 "You don't need a whole basket of vine-ripened tomatoes to make a delicious tomato bisque. We're going to use canned tomatoes. Rice makes this soup silky, not starchy." Heat olive oil in a large pot over medium heat; cook and stir onion and celery with a pinch of salt until onion is translucent, 5 to 8 minutes. Stir in garlic and cook until fragrant, about 1 minute. Pour chicken broth and tomatoes into onion mixture. Bring to a simmer and season with paprika, black pepper, and cayenne pepper. Turn heat to low and stir rice into soup; skim foam occasionally and simmer until rice and vegetables are very tender, 35 to 45 minutes. Add sugar. Blend soup with an immersion blender in the pot until smooth. Whisk 1/2 cup cream into soup and adjust levels of salt, cayenne pepper, black pepper, and sugar. If soup is too thick, add more broth; if soup is too thin, cook, stirring often, until reduced and slightly thickened, about 10 minutes. Ladle into warmed bowls; garnish each bowl with a drizzle of cream and top with about 1 teaspoon chopped basil. Delious!! I however did make one change and added sweet potatoes for a thicker more filling consistency. Other than that great recipe!! I have made this several times.... I added a bit of vinegar at the end and it was even better! Rounded out the flavors beautifully!